Although he opened his 2017 Value Voters Summit speech by echoing Ecclesiastes about the time of the season, former Trump Senior Adviser Stephen K. Bannon kept true to his street fighting instincts by declaring political war in a bombastic address to Evangelical voters in Washington DC. Bannon voiced frustration that many Republicans in the Senate were either Janus faced or openly hostile to their President Donald Trump. Bannon particularly took aim at Senate Majority Leader Mitch McConnell (R-KY) and Senate Foreign Policy Chairman Bob Corker (R-TN). 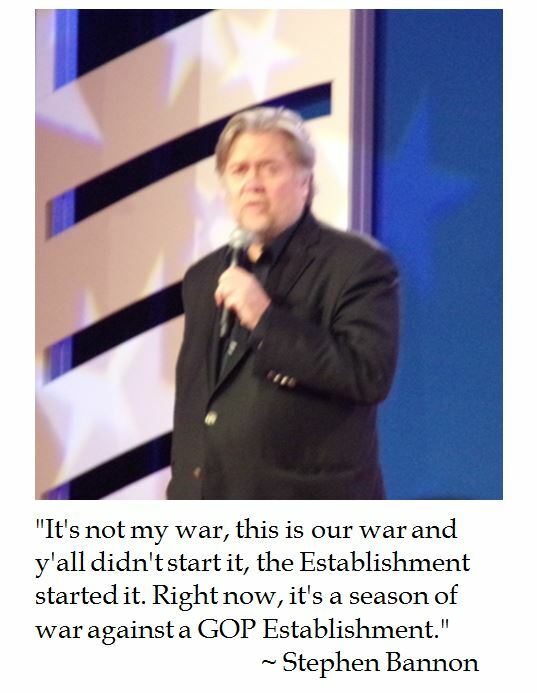 To wit, Bannon declared war on the GOP Establishment. As Bannon is no longer shackled as a White House West Wing advisor, Bannon is free to support the Trump nationalist populist agenda from the outside. Bannon intimated that he is working hard to primary many RINOs who do not support the Trump agenda. Bannon claimed that there is time for Establishment sinners to repent, but otherwise he insisted that Deplorables will come after those not supporting Trump during the 2018 primaries. This message was well received by the Values Voters Summit crowd. A constant theme during the three day conference of politically active Evangelicals was "Drain to Swamp." 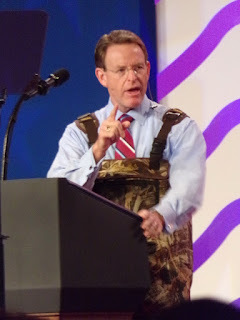 To underline that sentiment, Family Research Council President Tony Perkins honored his Louisiana roots and jocularly dressed in muck wear to open the Value Voters Summit. Over the weekend, Trump Administration Secretary of State Rex Tillerson was accused of saying that the President, his boss, was a "f***ing moron". This exasperated expletive was alleged uttered after President Trump's rousing remarks before the 2017 Boy Scouts Jamboree. When these comments came to public light, Tillerson held a news conference which denied that Vice President Pence needed to convince him to stay at Foggy Bottom because he never considered resigning. It is notable, however, that Tillerson did not back away from the original insulting allegation. This has led pundits to ponder how long Tillerson will remain as Secretary of State. 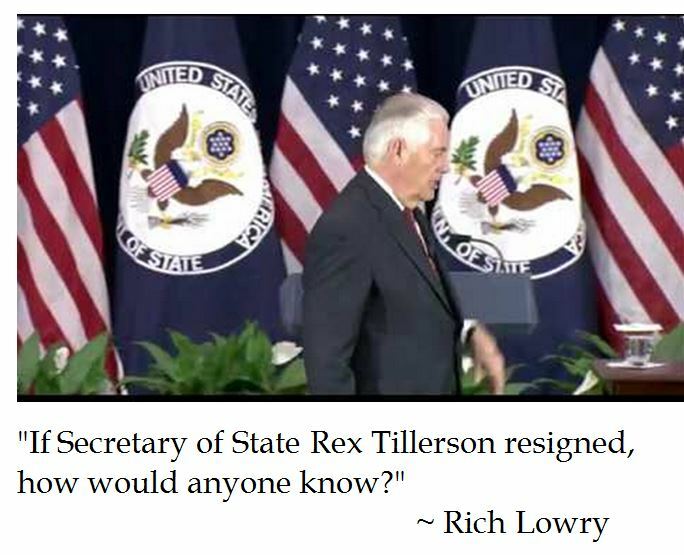 In the Politico Magazine, Rich Lowry wondered if anyone would notice whether anyone would notice if Tillerson left his position at Foggy Bottom. In the Trump Administration, foreign policy leads seem more driven from the Oval Office (or perhaps Twitter postings) than from Cabinet officials. Secretary of State Tillerson has voiced policy positions, particularly on Climate Change and Qatar, which seem at odds with President Trump. Moreover, @POTUS Trump has posted Twitter thoughts which undermine Tillerson attempts to achieve diplomatic solutions with North Korea. During his nomination hearings, Tillerson was vilified for his role at Exxon and connections to Big Oil. But through these petrochemical connections, Tillerson was said to have cultivated good relations with the Russian Federation. It does not seem that Tillerson has neither been effective in lessening tensions with Moscow nor distancing the Trump Administration from accusations of Russian collusion. One of Tillerson's virtues was that he had more of a business background than a political resume, thus his organizational skills might be different at Foggy Bottom. 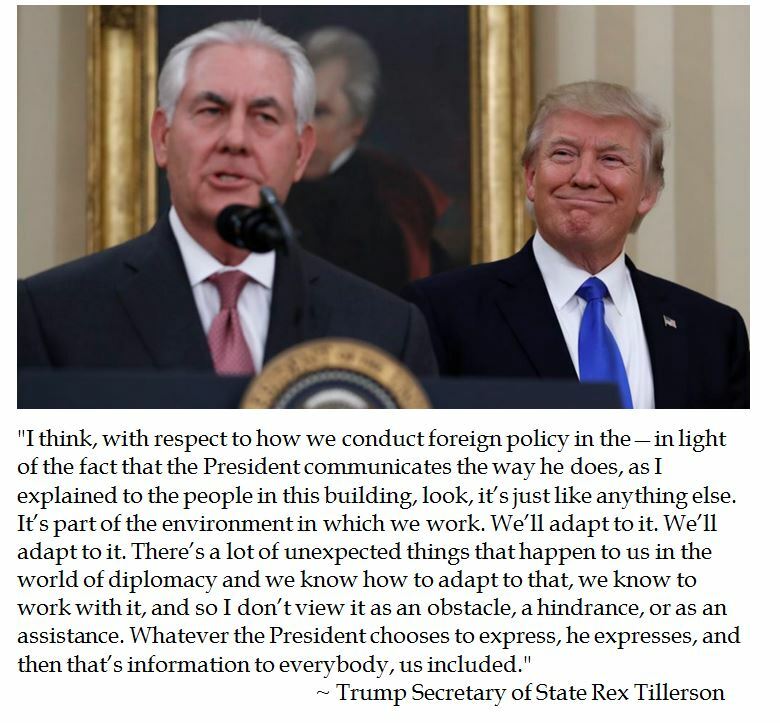 Perhaps this may be true on paper, but Secretary of State Tillerson seemed reluctant to clean house at the State Department. In April 2017, well after his confirmation, Tillerson indicated that he was in no rush to fill nearly 200 State Department posts. In August 2017, Tillerson announced that there would be fewer promotions at State. These may have been an attempt at pruning an overstaffed State Department, but it also gave the opportunity for Obama Administration holdovers to exert undue influence in Foggy Bottom. One of the major motivations for many loyal Trump voters is to "Clean the Swamp". In other words, to divest power from progressive elites who have burrowed their way into the bureaucracy. This is especially true in the State Department. But this is impossible to achieve if the chief acts like a short termer. In late July 2017, Tillerson confided with friends that he did not expect to last a year on the job. Notwithstanding his recent denial of resigning over the moron kerfuffle, Tillerson is not taking the broad measures to clean house. The Iran Deal is an example in which the State Department has been enthusiastic in promoting and preserving, yet it is in conflict with Mr. Trump's campaign promises as well as inklings from the West Wing. A cabinet official who is deemed a short termer will have little sway with the bureaucracy in aligning with the President's foreign policy predilections. Secretaries of State can take different tacks to their job. Henry Kissinger, who was Secretary of State under Presidents Nixon and Ford, took a leading role in formulating the realpolitik and detente foreign policies. George Schultz, President Reagan's long serving Secretary of State, did not seek the limelight and was able to earn the loyalty of State Department officers by staffing for professionalism rather than political concerns. Hillary Clinton, President Obama's First Secretary of State, did her bosses bidding by racking up frequent flier miles in visiting diplomatic outposts rather than take the lead on foreign policy. Aside from trying to shrink the size of the State Department by attrition and to stop relying on special envoys, it is unclear how Secretary of State Tillerson is making a difference at his job. Moreover, the friction between Tillerson and Trump on personal and policy fronts, makes his position tenuous. At a time in which Americans have been distracted by ephemeral issues like the NFL Taking the Knee during the National Anthem and dealing with disasters, such as hurricanes and the Las Vegas shooting, there are serious foreign policy concerns brewing. North Korea continues to be belligerent. The world will no longer buy the peace through bribes for worthless promises of non-aggression or denuclearization. While the United Nations has applied additional sanctions, this does not seem to be achieving the objective of de-escalation of tension or DPRK regime change. Considering a prospective conflict with North Korea, it would be unwise to have Secretary Tillerson leave his Secretary of State post at this time. However, presuming this situation with the Kim Jung Un regime comes to a head in the near future, it would be prudent to have a Secretary of State who is more in tune with the Commander-in-Chief's expectations for Foggy Bottom and who more accurately reflects (at least in public) the President's foreign policy positions.